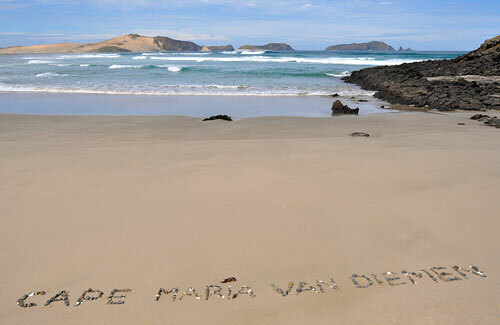 Cape Maria van Diemen. Kaap Maria van Diemen. 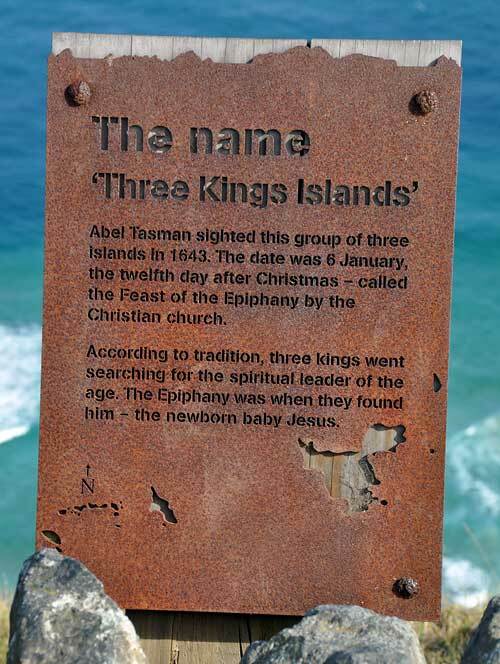 Three Kings Islands / Manawa Tāwhi. Driekoningen eiland. 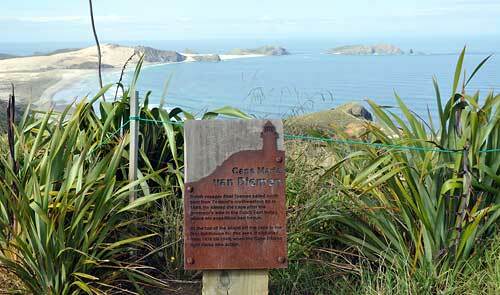 At Cape Reinga two seas meet. 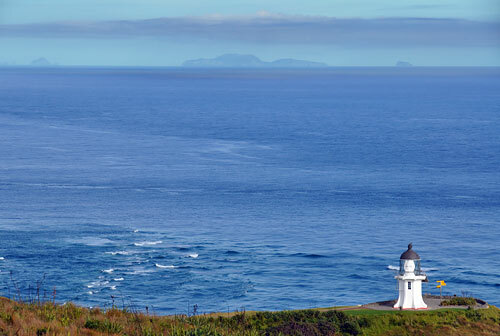 The rough Tasman Sea meets the quiet Pacific. There are several ways to get there. By scenic flight. By road, although the last 20km is an unsealed road. Or by ninety mile beach. Ninety mile beach is in fact only sixty six miles long. But ninety miles does sound longer doesn’t it? And anyway after being in the bus on the beach for approx. 50 miles I bet you will be happy it is only sixteen miles to go and not another forty. The landscape is amazing. It is at this point the spirits of the dead go on their long journey home. For such a spirit’s trip to London for instance is from here 20.000 miles, if we are to believe the signpost. Just in case after your death you may decide to haunt 9-11 Downing Street a bit before deciding upon your further exit strategy. Although you also can get there the other way round, which is as far. You may also take the shortest route and as a spirit you may not even need to dig a hole if you can stand the heat. 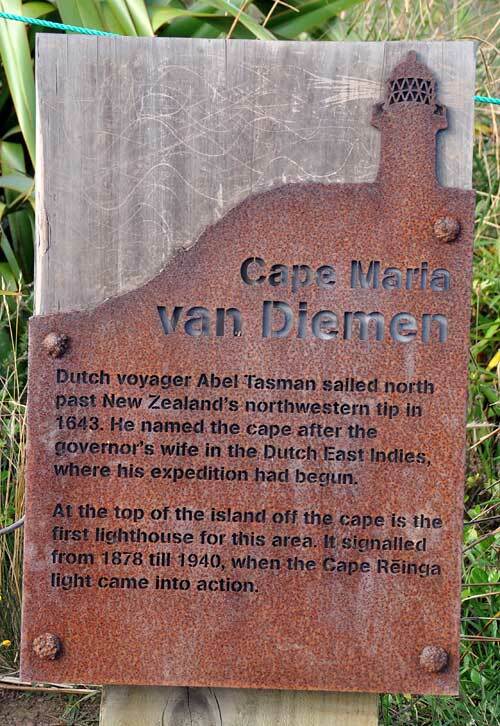 It was very close to Cape Reinga on the top end of the Tasman Sea where Abel Tasman left the shores of New Zealand to return to Batavia, Mission Completed at Cape Maria van Diemen. 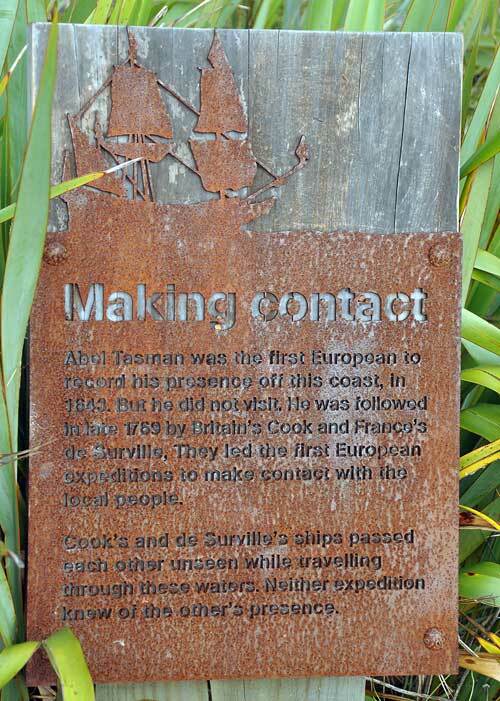 His mission was to look for the Southern Continent, which was rumoured to stretch the Pacific. Of course this mission took place before William of Orange took the financial centre of the world from Amsterdam to London. Hence Tasman undertook the journey ‘on behalf of their High Mightinesses States-General of the United Provinces’. Who had ever thought that of the goofy Dutchies? That this freedom loving hardworking folk had ever considered themselves ‘High Mightiness’? “This land looks like being a very beautiful land and we trust that this is the mainland coast of the unkown south land”. Alas, it was the South Island where he anchored off the coast of Golden Bay near Nelson. A small boat was sent out to look for drinking water and the visit was returned by two boats of Maori. They appeared friendly until they performed the Haka without informing the Dutchies that they were just welcoming the newly arrived tourists from Batavia by ramming the small boat of the Dutch with one of their canoes. They took off with one of the resulting dead bodies and we are not informed whether it was barbecue time that night. You’re sure of a big surprise”! That was one welcoming gesture too far for Abel and the next day the Dutch responded with some welcoming canon fire after letting the canoes approach closely first. That was the Dutch version of the Haka, which the Maoris took the wrong way also. “High Mightiness” is the translation of “Hoogmogenden” and that means something different. It’s an old Dutch denomination of rich people who founded the VOC and probably liked fancy titles. Beautifull place. Hope to visit it one day.